Peanut butter is a staple in this house. Many days it is incorporated into breakfast, lunch and a possible snack. The other day my husband was wanting something different for breakfast so we decided to whip up a Peanut Butter Smoothie. Luckily we already had a couple frozen bananas in the freezer. Whenever our bananas get very ripe we put them in the freezer for smoothies or banana “ice cream”. The following recipe makes 2 servings. Place the oats and milk in a blender. Let the oats soak for 2 minutes. Add the remaining ingredients and blend until smooth. Pour in to your favorite glass. Add some dark chocolate chips or grate chocolate on top for garnish. I keep bananas in the freezer. I like strawberries & bananas with vanilla Silk. Never thought to use the oatmeal. It sounds very good. I just noticed the oats. Instant oatmeal? I’ve never tried that before. Yes instant oats work great! Let me know how it turns out. I must try this. I love natural Peanut Butter , oatmeal and rice milk. I already have bananas in the freezer so this is perfect. Thanks for the recipe! Kamaya~ Keeping some bananas in the freezer is so handy! I hope you love the recipe. If it weren’t for smoothies I think my teenage daughter would never eat breakfast. Thanks for another recipe for her..I recently bought some natural peanut butter and it works better in the blender than regular. I love the texture of natural peanut butter and it is so tasty! I love your smoothie recipes. Keep them coming please. yum… I must try this!! This looks really good; thanks for sharing!! Hmmmm, guess what *I* will be trying this week! 🙂 Sounds really good, I feel like I have hit a wall with my green smoothies, I need to mix it up a bit. And Nick loves PB, so he might even try this one! 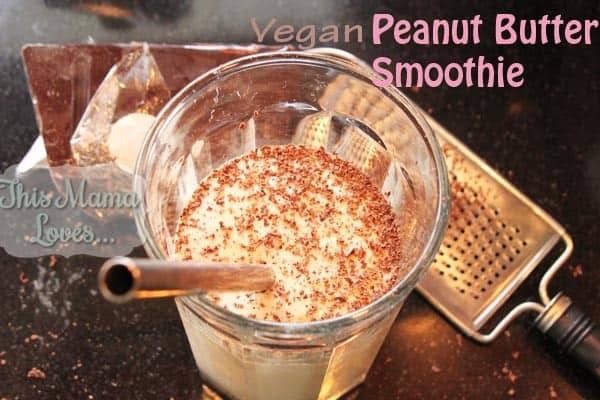 If Nick loves PB he will love this smoothie!! I love sneaking in the oats! I make smoothies for my husband’s breakfast almost every day and sometimes wish he’d eat oatmeal (which I love). Now I can combine the two and he’ll never know! He really won’t know and it makes the smoothie nice and thick. I love this idea for an after school pick me up,I also make a version of it for myself by adding a scoop of whey protein because I worl out every day. Sounds YUMMY and super easy 🙂 Thanks for sharing!